Dry Rub for Ribs (DIY Spice Rub Jars) make a great gift for those that love ribs, and double as a pretty talking piece that can brighten up a kitchen or living room. I love giving homemade craft gifts, especially around the holidays. This DIY project is quick as it takes just a few minutes to make each jar, so you can make a couple dozen for family, friends and coworkers in just an hour or two of work. I start with a Weck jar as they have a classic look and a nice shape. From there I just start layering the different spices one by one, most of which have a single tablespoon. Spice rubs are like marinades in that the recipes can be tweaked and modified with little risk. In-fact, I recommend it! In my house for example we are big fans of garlic and hotter spices so I’m always curtailing recipes by double-dipping on these favorites. As I began layering in each ingredient on the first jar my husband ran over and said I was doing it wrong since they weren’t level. As I completed that jar he saw the cool looking waves of colors that wouldn’t have shown if they were in-fact level. I guess that’s a matter of preference, but I am usually just fine with imperfections in food and art (and life!). Add a few varieties of seasonal leaves, needles or small branches and some quality twine tied nicely around the jar you’re all set. You can use a spice rub for much more than ribs, too. Other cuts of beef, chicken, certain fish, and even non meat items like tofu, tempeh and veggie kabobs all taste amazing by adding a nice rub. I have salt as one of my ingredients but for those on a low sodium diet it can easily be replaced. My attached video shows each of the steps, with quick links to buy each product. DubCandy videos like this one make it so easy to click and purchase a products that you see and like while watching a video. It’s unobtrusive and has a slick interface. You can use a spice rub for much more than ribs, too. Other cuts of beef, chicken, certain fish, and even non meat items like tofu, tempeh and veggie kabobs all taste amazing by adding a nice rub. Place all ingredients inside the jar. What a wonderful gift idea! I have friends who are always grilling ribs and this would make a great gift. I love how you added the greenery to make it even more festive. So pretty! What beautiful looking jars filled with spice rub. First making my own is always something I love to accomplish. Controlling what goes in and how much to meet our family likes. Plus of course these would look great in a gift basket. I can’t wait to have my husband do this. I think I’ll make up one of these containers for him for Christmas. He loves to grill, and we love to eat it. Wow, that’s literally the most beautiful spice jar I’ve ever seen! I have some family members that LOVE to grill, I’m totally trying this, this year! Oh, I am going to send this to my husband who is the cook in our house. Not only does the combination of flavors sound amazing, it also looks really cute in that mason jar! I love dry rubs. They’re such a perfect way to enhance the flavor of meat. This is also such a perfect gift for foodies. Who wouldn’t love a jar of this stuff?! My husband loves dry rubs. I’ll have to use this recipe for him to make me ribs! My husband loves making ribs during grilling season. This dry rub sounds like it would be great for him to use. This rub sounds like it would be very flavorful! I am already missing barbecue season. 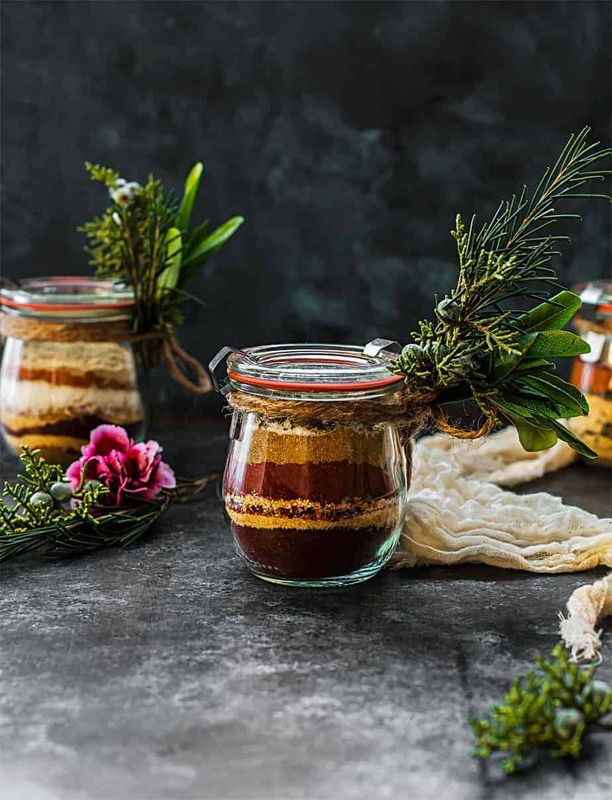 DIY dry rub spice jars make for great gift ideas. I would love to give a couple of my friends these jars with the dry rub for ribs. Thanks for sharing the recipe. Hi Rebecca, yes it was easy to make these in bulk, I got in a groove and in no time had a ton to pass out. With the contents being so affordable and I decided to make more than originally planned and am handing them out to some of my neighbors. We are going to try this, it looks amazing!! Thanks for sharing. Wow! Now that is a gift idea that I would love to receive. Your rub for ribs looks so amazing. My husband just loves ribs. This looks perfect! And my mom was just asking me if I had another rub to give her. I love dry rubs. I never thought of making my own for some crazy reason. It looks really simple so I will try it soon. Hi Emma, yes it’s funny that we often buy things that are so easy to make on our own. I bought dry rubs for years but ever since giving it a try myself I’ve had a lot of fun controlling the exact taste and saved some money in the process. I am not a fan of ribs but this rub sounds yummy!! I could see myself using it in place of other spices in recipes! My hubby loves ribs, and this spice rub sounds really good. I will have to share the recipe with him. I also love the spice jars you made. They look so nice. That is a creative and thoughtful gift. I am sure people who love to bbq or love making ribs would love this. My father loves this! I can’t wait to give this recipe to my mother. Thanks!